My Father, Mother and brother all suffered from depression. In 1996 my Father and brother both comitted suicide and my Mom died from cancer that same year. I have been depressed and taking Paxil since all this happened. Would it be correct in assuming that my depression is at least partially hereditary (genetic)? Not all depression is caused by inherited factors, but some depression is caused by negative thinking. Most men answered: I try to get my mind off of it and hit some golf balls(this is called distraction). This is mainly why it appears to be women who suffer from depression than men. You could be depressed because you may THINK about all of time. Major losses can also be because of your depression. Research indicates that depressive illnesses are disorders of the brain. Brain-imaging technologies, such as magnetic resonance imaging (MRI), have shown that the brains of people who have depression look different than those of people without depression. The parts of the brain responsible for regulating mood, thinking, sleep, appetite and behavior appear to function abnormally. In addition, important neurotransmitters?chemicals that brain cells use to communicate?appear to be out of balance. 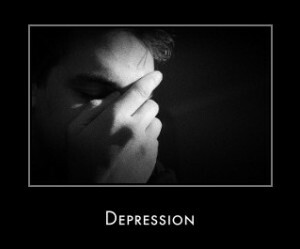 But these images do not reveal why the depression has occurred. More information on depression from The National Institute of mental Health is available on the website via the following links.